Some perſons in this Colony, it ſeems, are lately given up to a Diabolical Rage of beating, bruiſing, maining and torturing Couloured free perſons, as well as other man’s Slaves; Even the Government muſt be at a Loſs, how to prevent the evil, as effectual meaſures would require a Standing Court; I have been of an opinion, that every perſon in general, and Eſpecially the Officers in Public Service, to whom it is entruſted to keep up the Police, ſhould make ſome efforts to hinder the progresſes of the Epidemy, but I muſt acknowledge my mistake; there is rather reaſon to believe that, like in the ſmall Pox, the Inoculation is allowed; that the Poiſon is weakened by the meaſure in this caſe, is not probable, but where is the Cure? 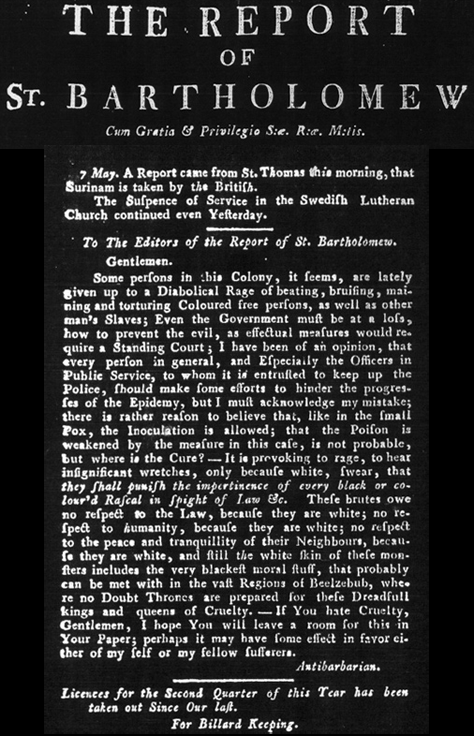 – it is provoking to rage, to heat inſignificant wretches, only because white, ſwear, that they ſhall puniſh the impertinence of every black or colour’d Raſcal in Spight of Law &c. Theſe brutes owe no reſpect to the Law, becauſe they are white; no reſpect to humanity, becauſe they are white; no reſpect to the peace and tranquillity of their Neighbours, becauſe they are white, and ſtill the white ſkin of theſe monſters includes the very blackeſt moral ſtuff, that probably can be met with in the vaſt Regions of Beelzebub, where no Doubt Thrones are prepared for theſe Dreadfull kings and queens of Cruelty. – If You hate Cruelty, Gentlemen, I hope You will leave a room for this in Your Paper; perhaps it may have ſome effect in favor either of my ſelf or my fellow ſufferers.